Who plays them? Who wants to play them? I’ve been hankering after playing some board games for months, mainly thanks to Mr Florence and his excellent DowntimeTown videos, followed by the Cardboard Children articles. A few weeks ago I bought some, and me and my girlfriend play most weekends. Great fun. I bought Castle Ravenloft, which seems like a great introduction and we’re finding lots of fun, and the miniatures are fantastic. Carcassone, a beautiful and elegant tile-laying game. Plus Munchkin and Race for the Galaxy, which I seem to be finally getting the hang of. Currently really looking forward to the reprinting of War of the Ring, which I believe is due around September. However, this stuff is addictive. I had been lusting after a certain game for a while. Today I received it in the post, still in its cellophane wrap. My father-in-law has stacks of boardgames, mostly war-themed. He recently picked up Washington’s War from GMT Games and we had a runthrough this past weekend – highly enjoyable. Hannibal is next, I believe. We’ve also done Hammer of the Scots, War of 1812 and a handful of others. Besides those, we + the family go through some European standards like Carcassone, Settlers of Catan, etc. There’s a boardgame version of Advance Wars that I’d like to print out and play at some point. And I’d reeeeeally like to get into stuff like Space Hulk with him. And, PC related: I bought Frozen Synapse and gave him a copy, though we haven’t duked it out yet. In summary, he’s pretty awesome. Most of the board game geeks around here are, well, just that. Oh! As for card games, I have a bunch of Magic cards. I got rid of 99% of my collection sometime in grade school, but I got the fiancee into it a few years ago and we’ve built a decent pile. Castle Ravenloft is a ton of fun, and I highly recommend it. It’s pretty simple to get the hang of and the multiple scenarios are (for the most part) excellent. My brothers and I play whenever we have a chance to get together. The game does hate you though. It makes that very clear. What I’d like to know is: is there a suitable replacement out there for Axis & Allies? I’ve had it for years and I’d like to see if there’s anything that’s comparable. Sadly I have no friends here who want to play boardgames or they find Risk and Monopoly to be advanced boardgames. Have Axis & Allies Anniversary Edition (never played it, but it was worth every penny), Axis&Allies Pacific 1940 (good enough game, but was still a bit disappointed. Obvious lack of plastic bits, poor quality on some things and the rulesbook was unclear on some key points), World of Warcraft boardgame (dont know why I bought it…complex rules and much downtime when playing), American Civil War (by Eagle Games) and Game of Thrones boardgame (among my favourites ever made). Ravenloft is very good but I wouldn’t recommend it since Wrath Of Ashardalon is out and that’s even better. It hates you in an entirely new way with enemies that force you to lay new tiles down or poison you which is a really swell time when you’ve got both kinds in your face, noone is playing as the Cleric and the Red Dragon shows up and starts breathing fire every turn because you are terribly unlucky at shuffling cards. A big table is required because it will fill up with tiles surprisingly quickly. Hadn’t heard of this – looks awesome! We should set something up, though I’d have some rulebook leafing to do beforehand, no doubt. Managed to get my friends totally hooked on Battlestar Galactica, which now takes place roughly once a week. We love the scheming, the backstabbing, the really excellent mechanics, and the hilarious fun of simply accusing everyone of being a cylon. With both expansion packs we’ve barely even touched the surface of the various variant gameplay setups, and so far we’re finding it pretty even as to whether humans or cylons win. Last match I screwed up a skill-check and revealed I was a cylon to one other player but managed to convince the other two players that I was human. Managed to stay hidden for another few turns, messing up a few critical skill-checks and eventually revealed myself fully, shot the admiral in the face, and started screwing them over with the cylon fleet. Genius game, love it. Used to be a big WH40k (dabbled in Fantasy) player, but then Games Workshop, er, changed. They moved out of my area - Massachusetts - jacked their prices and became less friendly over all overnight. Does Chess count as a board game? It is played on a board after all. I love Chess. But then I love Starcraft, so there’s probably some sort of relationship there. I dont think there’s much of a relation between SC and chess, well maybe speed chess. I like boardgames, but all my friends hate them so it’s a bit of a problem. I’ve heard that there’s a Starcraft board game, maybe that’s worth a look-in. +1. Its my current fav board game too. The only tricky bit is explaining it quickly and concisely to new players… it’s not really that complicated but the humans need to play well and make the most out of any available perks in order to win. The Starcraft Boardgame is surprisingly good. However, in a four or five player game, the Zerg will lose because not being able to keep up with any air units the other races will throw at them after a while. The Broodwar expansion is supposed to work wonders on that (I’ll get mine at the next Spiel 2011 - Europe’s largest boardgame fair in Essen). 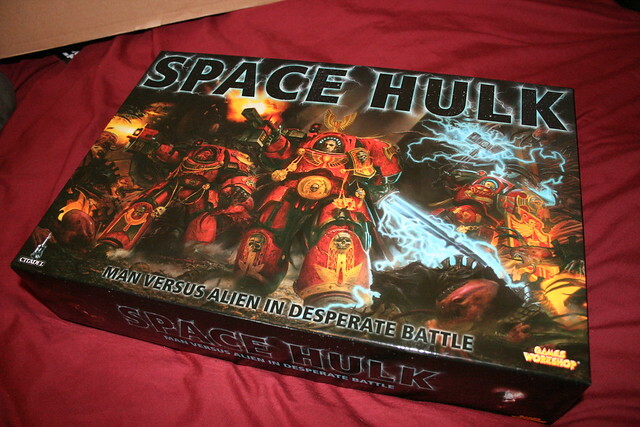 That said, congratulations to Space Hulk, and welcome to the gaming family. I really want to play some board games, Cosmic encounters, Battlestar Galactica and Chaos of the old world really appeal to me but i have no one really to play with so i can’t really justify the price of buying them which is a shame. I would love to have a regular of playing these kind of board games, and some P&P RPGs as well. People put locations in your profile! Am on hols for next couple of weeks, then I return to London and WILL forget that I am a social misfit and get some games going. I have a few games and would like to get something regular together if I can find no alchohol, no smoking, no cheetos people to play with. Ok, I’m relaxed about the alchohol (keep it away from the table) and the smoking (outside only) but touch the cheetos and then touch my cards and well… oh I’m a very very weak person so that ‘well’ would be a huffy pique and a raised eyebrow. Race for the Galaxy is all kinds of brilliant. Battlelore/Memoir 44 are great for adversarial 2 player combat. Runebound and WOW the adventure game are good for fantasy romps. Have an old unpainted spacehulk, Space Crusade and D&D boardgame. A few Euros like Goa, Hansa, Queen of Thebes -that are alrighty but I definitely prefer figures and dice rolling. Whole bunch of unpunched hex wargames. Must ebay them soon. My wife and 2 friends of ours (who live 2 hours away) often play Tichu, Dog or Dominion there while talking on Skype. As for classic board games - Settlers of Catan is still the greatest thing since sliced bread (as long as the “Cities and Knights” expansion is used). Currently Puerto Rico is our game of obsession, although when we want a quick fun round we always reach for Ticket to Ride. And when we have 5 hours and a high pain threshold, we go to Arkham Horror. Hmmm, few more details Randy? Basic one I can think of is Village of Fear and possibly some of the others in that series. Move figures and battle through a village to take a big bad on in his castle at the end.